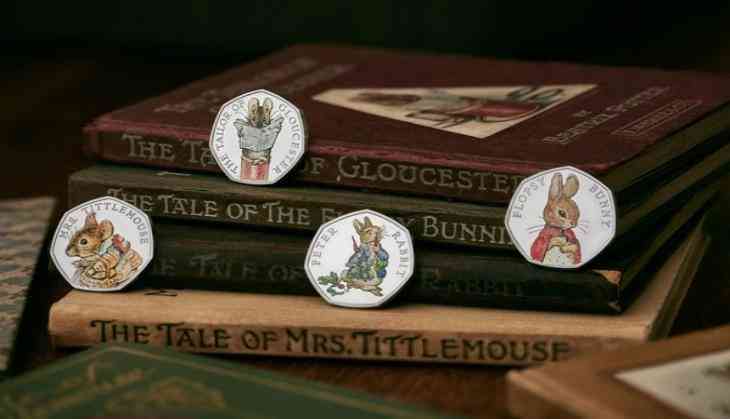 A new set of coins will commemorate 109 years of Beatrix Potter's children's book, 'Tale of The Flopsy Bunnies'. The coins will feature Peter Rabbit, Flopsy Bunny, The Tailor of Gloucester, and Mrs. Tittlemouse. The illustration book drew elements from Potter's previous works - The Tale of Peter Rabbit (1902) and The Tale of Benjamin Bunny (1904). The four new designs will add to the Royal Mint's original collection of Beatrix coins, first released in 2016 to mark 150 years since the author's birth. The first coin to go on sale is of Peter Rabbit and will be followed by others in the coming months of the year. According to The Independent, each coin is embossed with hand-painted illustrations from the book, which Potter herself produced. To start with, silver-proof coloured coins will cost 60 GBP each, followed by 'brilliant uncirculated silver' coins for 10 GBP each before the introduction of plain metal ones in the market. Similarly, last year 50 p coins featuring Benjamin Bunny, Peter Rabbit, Jeremy Fisher, and Tom Kitten were also released.